Back in the late 1980s, a small group of terrorists decided they wanted to kill Americans, and to do it in the most visible and costly way. Years later, on February 26, 1993, a van exploded in the parking garage of the World Trade Center, damaging the buildings and killing six people. In 1994, four defendants were each found guilty in federal court, and four years after that, a man in Pakistan was arrested for connection to planning the bombing. Bill Clinton's Justice Department believed they had handled this "crime" effectively. 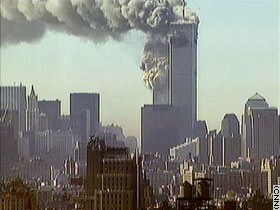 But while the trial for the WTC bombers was being planned, Osama bin Laden was already planning a greater retaliation against America, whcih came to pass on September 11, 2001. Al-Qaeda bombed U.S. embassies in Kenya and Tanzania, killing hundreds of people. They also had connections to the deaths of U.S. military personnel serving in Somalia in October 1993 and several attempted terrorist operations, including the failed assassination of the Pope when visiting Manila in 1994, bombings of the United States and Israeli embassies in Asian countries in 1994, the mid-air bombing of a dozen U.S. international flights in 1995, and a plan to kill President Clinton in 1995. President Clinton had no response to any of these events. President Bush has taken a lot of flak for responding to these attacks as he has. Many on the Left would like to believe that there was no threat to the United States, that somehow the 9/11 attacks were our own fault. Senator Kerry promises a more "sensitive war", as if that would resonate with murderers. Senator Kerry chided President Bush for taking three-year old information seriously, even though the attacks for September 11 were discussed five years before the event. Kerry claims he supports the troops, even though he voted to deny them vital equipment and funding. and 45 killed on United Airlines Flight 93. For comparison, 2,403 Americans were killed at Pearl Harbor on December 7, 1941, which began a war we fought for the next four years, including the use of Atomic weapons, and the occupation of two major nations for the better part of a decade, and troop bases which are still active in both countries. Nobody calls World War 2 "the wrong war in the wrong place", however. We're not supposed to talk politics on the third anniversary of 9/11, so I will talk about Life and Death. John Kerry may have fought well in Vietnam, but ever since he came back, he has been a disgrace to our troops and to the United States of America. George W. Bush may have been an embarassment thirty years ago, but these days, he is a resourceful and bold leader, at a crucial point in U.S. History. Earlier this week, John "Wannabe" Kerry amused himself by playing on possible meanings for the "W" in George W. Bush's name. Sure, it was childish, irrelevant to the election, and spoke to none of the pressing issues of the moment, but then, egotistical petulance is the one constant in the Kerry campaign. Trying to find a way, somehow, to stop the free-fall of his support, Senator Kerry sent out his attack dogs this week, as well. Since McCain-Feingold went into effect on September 4, he could not attack directly, nor has direct attention been John's style anyway, but no matter, John has plenty of '527' groups at hand, to work to his advantage and the President's misery. There is George Soros, a mega-rich foreigner who has donated $15.5 million dollars to Kerry in hopes of defeating President Bush (and that's only the 'official' amount), there is Michael Moore, whose hit piece so redolent of bile and propaganda has gained the love of psychotic malcontents and students of character assassination, and of course, there are legions of willing syncophants, if your politics are sufficiently left-of-center... and reality. But there is a point, at which, as the British like to say, someone gets a case of "the clevers". Like the classic cartoons of 'Spy vs. Spy' in Mad Magazine, intricate and devilish plans can come back and blow up in your face. It looks like not one, but three of them, have exploded this week in the vicinity of the DNC character terrorists' hideouts. First, the obvious one: CBS used forged documents to attack President Bush in Wednesday's edition of "60 Minutes II". The proportional spacing, the curved quotation marks, and the superscript 'th' in "187th" are hard evidence that the document was prepared by a word processor at least 20 years after the alleged date. What's more, the man who supposedly wrote the memos, Lt. Col. Killian, died in 1984 and so cannot speak to this issue, but his wife and son say the writing is not his style, that personal memos were not his habit, and his son, Gary, went on to note that his father did not like to type, and was far more likely to write longhand, but in any case did not keep any sort of private files, or make the sort of comments the documents purport. CBS continues to insist the documents are genuine, in much the same way O.J. Simpson reminds us he is searching for his wife's "real" killers. Next, we turn to Kitty Kelley, whose new book attack on the President is based largely on a claim supported only by an interview with Sharon Bush. Unfortunately for Kitty, Sharon denies Kitty's claims, and notes that Kelley is writing about comments from 2003, when a messy divorce led to a lot of ill-chosen words and false accusations. Then, there is the claim from Sunday's edition of "60 Minutes" by Ben Barnes, who claimed he helped young George W. Bush get into the Texas Air National Guard, and gee, he feels badly about that now. Problem is, a little look shows a lot more problems for Mr. Barnes, than for Mr. Bush. First, Barnes is a Kerry supporter. Big-time. Like, he has given more than a half-million dollars to the Kerry campaign, and is identified by CBS News as a Kerry "lobbyist". It's also interesting that he claims "I got a young man named George W. Bush into the National Guard when I was lieutenant governor of Texas". Problem is, George W. Bush entered the TANG in mid-1968, and Barnes did not become Lt. Governor until 1969. So, that's not even a smart lie, it's just an obvious one. Also, Barnes' daughter, Amy, says she overheard her dad promise Democrats he was willing to fabricate his story, in order to hurt the President. Amy said "he's doing it for purely political, opportunistic reasons". I guess Barnes never figured he might have an honest kid. So, what we have here are three false charges against the President. And what's funny is, they're stupid, they don't address any of the known issues the voters say they care about, and they look desperate. Really desperate. The 'F' might stand for 'Foolish'. Add to this the "Adventures of Lieutenant John", such as his 'Christmas in Cambodia', which has been disproved, his claims to have participated in officially-sanctioned War Crimes, his rice-inflicted Purple Heart, his 'valor' in returning after running away from a firefight where there was no enemy fire, and his in-field film-making farcical exploits , and we have an image for John Kerry, though not the one he would choose. Maybe that 'F' stands for 'Fraud'. Consider that John Kerry has been in the U.S. Senate for twenty years, and has never sponsored even one signature piece of legislation. Could be, that 'F' means 'Failure'. Consider that John Kerry attacks President Bush's decision to invade Iraq, but also admits that in the same situation, he too would have invaded, although he still insists he would have done better. Perhaps the 'F' means 'Flummoxed'. Consider that John Kerry has promised that he, personally, would somehow make sure 10 million new jobs were created in four years if he were elected, although he has not, ever, explained how he would make this happen, or shown any history of raising employment in Masschusetts. Maybe the 'F' stands for 'Fabrication'. John Kerry compared President Bush yesterday, to the man in the 'Good Samaritan' parable who just walked on by the man who was beaten and robbed, although a comparison between the two leading candidates' personal acts, shows that for the tax years 1991 through 1993 (the only time when tax data and charitable contributions are on record for both men), Kerry gave 0.3% of his income to Charity, while Dubya gave 9.1% of his income to help others. Ahhh, maybe the 'F' is phoentic, and really stands for 'Pharisee'. Well, whatever it means, I'm pretty sure the voters aren't Fooled. The question has come up on another site, about who is the most reliable poll. That’s a good question, so I decided to look into it. The National Council on Public Polls had a nice site up, where they have reviewed the poll results for Presidential elections since 1936, and they have posted their results. I have a slightly different methodology for counting accuracy, so my results are slightly different, but all in all the information produced useful trends. OK, for this review, I am only going to count polls still in operation, since there’s already quite a few to check. For each election, I take the actual election result, and tick off a point for each point of deviation in the prediction in any direction on the final poll from each group. Zogby: Predicted 48-46 Gore, off by 2. Gallup: Predicted 46-48 Bush, off by 2. USA Today: Predicted 46-48 Bush, off by 2. IBD/CSM/Tipp: Predicted 46-48 Bush, off by 2. Pew: Predicted 47-49 Bush, off by 2. ABC/WP: Predicted 45-48 Bush, off by 3. NBC/WSJ: Predicted 44-47 Bush, off by 5. Battleground: Predicted 45-50 Bush, off by 5. ICR: Predicted 44-46 Bush, off by 6. CBS: Predicted 45-44 Gore, off by 7. Rasmussen: Predicted 49-40 Gore, off by 9. ABC News: 44-37 Clinton, off b y1. NBC/WSJ: 44-36 Clinton, off by 2. CBS/NYT: 45-37 Clinton, off by 2. Harris: 44-38 Clinton, off by 2. Gallup: 49-37 Clinton, off by 6. USA Today: 49-37 Clinton, off by 6. Harris: 50-46 Bush, off by 3. ABC News: 54-44 Bush, off by 3. CBS/NYT: 52-43 Bush, off by 4. Gallup: 56-44 Bush, off by 5. USA Today: 52-42 Bush, off by 5. Gallup: 59-41 Reagan off by 0. ABC News: 57-39, off by 4. CBS/NYT: 58-37 Reagan, off by 5. Harris: 56-44 Reagan, off by 6. USA Today: 61-34 Reagan, off by 9. ABC News: 46-41 Reagan, off by 5. Harris: 46-41 Reagan, off by 5. Gallup: 47-44 Reagan, off by 7. CBS/NYT: 44-43 Reagan, off by 9. NBC News: 42-36 Reagan, off by 14. Gallup: 49-48 Ford, off by 3. ABC News: 48-47 Carter, off by 3. Harris: 48-47 Carter, off by 3. CBS News: 45-41 Carter, off by 12. Gallup: 62-38 Nixon, off by 1. Harris: 61-39 Nixon, off by 1. Gallup: 43-42 Nixon, off by 1. Harris: 45-41 Humphrey, off by 4. Gallup: 64-36 Johnson, off by 7. Harris: 64-36 Johnson, off by 7. Gallup: 51-49 Kennedy, off by 2. Gallup: 60-41 Eisenhower, off by 3. Gallup: 51-49 Eisenhower, off by 9. Gallup: 50-45 Dewey, off by 10. Gallup: 52-49 Roosevelt, off by 5. Gallup: 52-48 Roosevelt, off by 6. Gallup: 56-44 Roosevelt, off by 12. 1. Zogby: 2 elections, 1.00% error average. 2. IBD/CSM/Tipp: 1 election, 2.00% error average. 3. ABC News: 7 elections, 3.29% error average. 4. Harris: 10 elections, average 3.70% error average. 5. Gallup: 17 elections, average 4.82% error average. 6. USA Today: 5 elections, 5.00% error average. 7. ICR: 2 elections, 5.50% error average. 8. NBC News/Wall Street Journal: 4 elections, 6.25% error average. 9. CBS News/New York Times: 7 elections, 7.00% error average. 10. Battleground: 2 elections, 7.00% error average. 11. Rasmussen: 1 election, 9.00% error average. Zogby, IBD, Harris, ICR, NBC News, and Rasmussen provide no demographic data. ABC News, CBS News provide limited demographic data. Gallup, USA Today, and the Battleground polls provide extensive demographic data. This provides a background for reviewing poll releases. Note that there are eleven national polls out this year, which do not have a known track record, including TIME and Newsweek magazines, the American Research Group, NPR, the LA Times, Quinnipiac University, and Marist University. 55 days to the election, and the pace has picked up. With all the attention on the state polling, I decided to take a look and see how they balance out against the national polling. I have been watching the polls all year long, and annoying my poor wife with piles of notes and calculations (hey, I think better on paper!). I found a problem early on, though, with the state polls. Although 81 different groups have done some sort of state polling, most have not done 3 states or more, and so their reliability or potential bias is difficult to measure. Also, state polling does not release demographics, for the most part, making them even less trustworthy. I wrote about this back on August 23. The good news for Kerry here, is that he is on track to gain 21 states plus D.C., one better than Gore did in 2000. The bad news for Kerry, is that with the shift in Electoral Votes for each state, Bush can afford to lose New Hampshire and still win re-election. It’s also worth noting, that there are 17 states where Bush tracks more than 50% of the vote, while Kerry has 11 states where he tracks more than 50%. The average Margin of Error in a poll is 3.1% and there are 9 states where the difference between Bush and Kerry is within that MoE. Also, when the number of undecideds is added to the MoE, a “shadow” is created, and President Bush has only 12 states which show a lead greater than that shadow. Kerry has only 8 states where his lead is greater than the shadow. Obviously, then, the race is still largely unresolved. Also, if the percentage of each state is applied to the 2000 vote, and a national tally applied, this state-vote projection says Bush would win nationally, 46.2% to 45.3%. That’s a smidge low on both ends, because of the undecideds, and it occurs to me, that most state polls were before the GOP Convention. So, fiddling with the numbers to take into account the most recent polls when valid, and the national tally becomes 47.9% to 44.4%. Now it gets interesting. National numbers are, if you think about it, derived from each state, so if I take the national poll numbers, and reverse them back to see what brings up the current 49.7-44.5 lead for Bush (according to RealClearPolitics), then Bush picks up Pennsylvania and Wisconsin. So, its seems reasonable to me to say, that Kerry still needs to push to take Florida and work in Ohio, Michigan, Wisconsin, and Pennsylvania. If it ends today, Dubya wins. Kerry would take California, Connecticut, Delaware, the District of Columbia, Hawaii, Illinois, Maryland, Massachusetts, New York, Oregon, Rhode Island, Vermont, and Washington, for 172 Electoral Votes. President Bush would take the remaining 38 states, for 366 Electoral Votes. If 55% of the Popular Vote seems unrealistic to you, please review the historical averages of Presidents running for re-election, especially under comparable economic conditions, and note the measure of ‘undecided’ voters at this time. A few weeks back, in discussing the effects of the Democratic Convention, I mentioned that one thing we should agree on, is that John Kerry was ahead. Now that the Republican Convention has been held, while there is a measure of debate about the different results from the polls, it should, as a starting point, be agreed that the President is clearly in the lead. This does not, of course, mean that the election is decided, not with eight weeks remaining and all they contain in words, events, and debate, but we have to start with at least one reasonable foundation, and here that means we start with a President leading his challenger after Labor Day. Historically, that bodes well for the President, though it’s fair to remind Republicans that these are unique times. If the War in Iraq must not be confused with the wars before it when considering whether it might hurt Bush, it should also be remembered when considering whether Kerry is really out of things. Of course, in a way that statement is disingenuous, as it suggests that the War, rather than the Economy, is the driving force for this election, which History would quickly disprove. FDR got into trouble in his 1944 campaign, in large part because the Second World War was expensive and many people had begun to question why the economy was still so tight, and rationing of oil, sugar, rubber, and metal still continuing. If it was reasonable to debate the Economy while fighting Hitler, it’s reasonable to debate the Economy while fighting Osama. But actually, I’m still not being fair to Senator Kerry. He did bring up the Economy earlier in the campaign, actually; he just couldn’t get any traction with it. Now that Unemployment is down to 5.4% (‘full employment’ by a number of classic definitions), and the GDP continues to rise, and Consumer Confidence remains stronger than it was in 2002 or 2003, poor John is going to have to figure out how to make his cry for ‘change’ sound reasonable. That, and given his long concentration of focus on his Vietnam in-country service, makes it hard for John to change his theme and argument now. The other serious problem for John Kerry, is the limited remaining opportunities he has to get his message out. Early in the campaign, John had the chance to reach voters with his message during the primaries. When he realized that Howard Dean was not winning over the voters, Senator Kerry became John “Not Dean” Kerry, and took Iowa. When he became the front-runner, John Kerry began to fed off discontent against President Bush, and so changed his campaign to John “Not Bush” Kerry, which essentially got him the DNC nomination. Unfortunately for John, he was unfamiliar with the nature of a national campaign, and so it came as a shock to Kerry to discover, that folks in Nebraska don’t think the way folks do in Massachusetts, that what sells in Connecticut might fall flat in Missouri. Oops. Kerry compounded the problem, by refusing to reconsider his message. After all, he reasoned, he was the one with experience and deep appreciation of subtlety. Imagine finding out Marines didn’t value subtlety the way he did, that people would put American interests ahead of an internationalist worldview. How plebian, how parochial! So, John Kerry set out to prove himself a regular guy. Maybe he couldn’t pull off ‘Joe Six-Pack’, but surely the regular people could appreciate a fine Chablis? Certainly they didn’t expect him to really eat food at Wendy’s? Surely they would find deer hunting on your belly, and regular trips to the coast for windsurfing ,to be regular-guy stuff? Oops. So, as his lead refused to grow, John Kerry realized he had to find a hook to show he was a red-meat American, even if his plate was all Quiche and truffles. And that meant rolling out the home movies of John “Purple Heart” Kerry. A few dozen phone calls to guys he used to know, and with favors promised and stories embellished, the Convention theme was ready to go, complete with television flag and fireworks, and protesters carefully barriered behind concrete and wire. John told (again & again) his heroic exploits in ‘Nam, making sure that everyone had heard him at least four or five times, and the Senator waited for the plaudits to roll in and his lead to grow. Well, the media gave him praise, but the lead didn’t grow. In fact, it shrank. After a while, it went away, and after a while longer, it showed up on the doorstep of President Bush, begging to be let in. Ooops. John Kerry went into an extended mope. How could this be! He raged at the empty house, and for that got into trouble with Tereza. After all, a politician may be forgiven, unless he is a losing politician. Ooops. So, here we are, John “Mutating Message” Kerry watching President Bush slowly pull away to re-election, and trying to figure out what to do about it. The debates lie ahead in October, and there are eight weeks of trash ads from Soros and Moore and Kerry’s other shadowy ‘527’ friends to be endured, but it’s hard, at this point, to see what gains John “I’m Not Like Michael Moore, I Just Talk Like Him” Kerry can produce from his new plan. It’s kind of sad, when you can begin the political post-mortem before the patient is done twitching, but then, it is just as sad, when a major-party candidate actually fools himself into thinking he can win the White House on nothing more than spite and nuance. A few thousand years ago, the rulers of various kingdoms had a common problem. Some information needed to be sent to their families and allies, but could not be trusted out in the open, where enemies could use it to hurt them, even bring them down. A common solution rose in these places, an invention we call ‘writing’. Symbols were drawn onto tablets or onto animal skins, and only certain people knew their meaning. This allowed rulers to send messages to distant allies, knowing that even if the messenger was caught by an enemy, he did not know the message and so could not reveal it, and even the tablets/skins would not reveal the message if discovered. Control of information was a source of power and protection. Later, kings found it necessary to employ scibes and couriers, and information began to seep out. The nobles addressed this matter, by hiring criers to go from town to town, speaking the news as the Crown wanted it known. These proclamations became the official version of news, events, and history. Minstrels learned that they were paid well to sing the king’s praises, and people discovered ‘spin’ in the difference between what they heard from the King’s paid criers, and what they learned from their neighbors. The Catholic Church spurred one of the first Information Revolutions, by making sure their priests not only spoke and read in a number of languages, but were often more learned than the courtiers of many courts. As a result, most kings found they needed to include a priest close at hand, in order to know the news from other lands, a different and intelligent perspective, and to develop a more effective policy for dealing with other nations. There began, however, a tug-of-war between Crown and Cassock for whose version of the truth would be held more highly. This led, indirectly, to the development of the newspaper. When Gutenberg published his Bible, it gave the Crown a means to send the news out in print without using scribes, who would have reported to the Church. It also provided a counter to the rising group of self-professed sages and local authorities. The Crown could and did publish proclamations as quickly and in such quantity as it desired. Leave to the Americans, of course, to mess up a good thing. One of the important causes of the American Revolution was the discontent in many colonies. This was spurred on by news provided by local newspapers and journals. Ben Franklin is an American hero, on the strength of his writings and newspaper. Thomas Jefferson became known to many Americans through the eloquence of his work on the Declaration of Independence. America came to represent the free expression of ideas. America also came to represent the free access to education. At the time of the American Revolution, most schools existed as they had for thousands of years - the best academies and universities were open only to the wealthy and influential, and the average child could only hope to become an apprentice to a minor craftsman, and so be bound to guild membership and limitations. People were not only restricted to their class, the operational conditions set those rules in place from birth. The American Revolution changed that. With free public education, there were still hurdles to clear, and society moves slow as glaciers, but at least in theory, the class ceiling had been removed (we’re working on the glass ones). Fast forward to the last half of the 20th Century. With radio and television, print news had risen to the pinnacle of influence, only to find rivals in the new media. Like the courtiers of old, then, the media all sought to gain closest access to the American elite, Congress and the White House. As a result, the Establishment line became the media foundation. J Edgar Hoover was able to spin the FBI as the all-American defenders of liberty, and for decades the public did not learn about the illegal wiretaps, the attempts to discredit civil rights leaders, and the blackmail of leading politicians. Radio and TV did the same, building up their reputations by keeping big names happy. Schools did the same, first by supporting the official history as spun from D.C., whether the traditional views through the FDR Administration, or the radical revolutionary views embraced by Democrats after Vietnam. In the White House and in Congress and in the Courts, the Democrats dominated the government of America for most of the 20th Century, and the courtiers kept their paid allegiance. The thing is, though, Americans hate lies. Look at the history. George Washington was famous as the President who "cannot tell a lie". Lincoln was famous as "Honest Abe". More recently, LBJ’s support plummeted when Americans came to believe they could not believe him about Vietnam. Nixon would have survived the Watergate scandal, except that Congress and the American public discovered he had lied about his knowledge. Bill Clinton was able to deflect examination of his behavior,only until it became obvious that he had lied while under oath. Eventually, this dishonesty became apparent in the media. The old Soviet Union could not survive the Information Age. Dissidents found they could self-publish at their computers, they could fax and e-mail events to anyone, anywhere. That kind of sunlight proved unstoppable. The same force applies here. Just as the Print Media ignored Radio, then Television, as fads and minor trends, the media conglomerates dismissed the Internet traffic as nothing more than annoying buzz. But with Mega-Search Engines, affordable web hosting, and insatiable curiosity for new insights and current information, weblogs took off with surprising acceleration. News sites like Yahoo! and CNN attracted news junkies, and when people started looking for additional information and detailed analysis, the search engines helped them find out about weblogs. Word-of-mouth spread the news, and by now even the general public is beginning to find blogs not only interesting, but unique. The best example of this year’s impact, perhaps, is the Swift Boat Veterans scandal. John Kerry was basically getting a free pass from the Mainstream Media. Personally, I don’t think this is because of a conspiracy to put Kerry in the White House, but rather, the desire to create a buzz, and so whet an appetite for a good year-long story from making the race closer than it ought to be. This is also why the MSM reacted as it did when the vets became impossible to ignore: The MSM reaction is a combination of the desire to avoid admitting their bias, while still producing emotion and debate to attract an audience. So, here we are, young lions in the field, exploring the limits and varieties of our power and influence. Just as newspapers discovered the range between responsible news reporting, cutting-edge investigation, and rabid rumor-mongering, we bloggers are discovering all sorts of sites are out there, and while many of us understand the need, implicitly, to fact-check and consider the effects of our posts, not everyone does, not everyone even wants to be careful. Fortunately, the blog community has been largely self-policing, so many new visitors get a reasonable guide to the best places for different perspectives and information. It remains to be seen, how far we will grow in power and influence, whether we become a new facet to information dispersal, or whether we will, as I suspect, eventually displace some of the older medium in how people collect opinions and evidence to make their decisions. Immediate comments by readers, the ability to analyze events as they happen, and the wide, borderless, capacity for audience offer tremendous opportunities for global growth. The limiting factor, of course, will be cost, as expanded attention will require advertising. Fortunately, companies such as ebay and Google are already offering options which may fit the blog-world in ways that the old advertising compaies never considered. Also, the need for web translation (I did say ‘global’ growth) makes the development of innovation an obvious checkpoint for the near future. Then again, the increasing acceptance of Colloquial English as the global language (take that, Esperanto!) and the development of compatible Internet communications, may lead us in a completely different direction. Ironically, we are about to come across an unanticipated test to weblogs. Many blogs have been created for special interests, such as the coming election. The question remains for many, what they will write about after November 2? There is a cycle to many things, and interest in blogs may well drop off after the source of much interest is over. After all, who goes to check the site for Super Bowl XXXVIII these days? Who spends part of every day reading up on the OJ Simpson trial, so long after it’s over? We have the responsibility to remain relevant, and this is one place where we will see wheat separated from chaff. Me, I’m talky beyond all reason, so I expect to be around for quite awhile, but I will be interested to see what happens to the traffic as Christmas aproaches. Maybe I should hedge my bets by soliciting ads from Toys R Us? Anyway, I hope I will find you, my dear readers, following my opinions on Polipundit and at Stolen Thunder, and writing your comments, as I plug along. After all, we are all fellow revolutionaries, and we don’t even need powdered wigs or theme songs! The Nation will choose wisely. OK, so after a title like that, you probably figure my next article will be about the sun rising in the morning, or the fact that economic changes tend to operate in cycles. But it seems fit to me, to explain why President Bush should be re-elected, rather than just review the numbers. 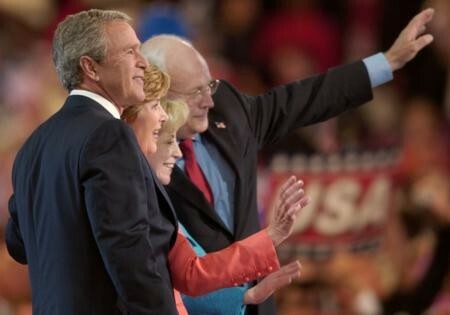 To be honest, when President George W. Bush ran for President in 2000, I supported him because he was the Republican candidate, and because I could not find a single valid reason to support the Democrats' candidate, then-VP Al Gore. As for Ralph Nader and the other minor-party selections, far too many of them were single-issue candidates, and others frankly lacked the minimum resumes to be taken seriously. As for Dubya himself, I liked him, but if the Democrats had been able to field, say, a candidate serious about foreign policy, serious about judicial restraint, serious about being a Democrat more like Truman than McGovern, more like John Kennedy than Ted Kennedy, I would have seriously considered the Democrat. My opinion of Dubya was confirmed, however, in his first foreign crisis. Many people have forgotten the collision between a Navy plane and a PRC fighter jet in international waters during early 2001. The matter could easily have been a disaster, if the response had been too far in either direction. If Bush had been too strong, he could have precipitated a military incident, with loss of life in addition to the Chinese pilot who died in the crash. If Bush had been too passive, the US could have forfeited their right to aerial and electronic reconnaissance in international airspace. Far too many people never watched the response, the carefully measured words and actions, which got back the crew of the aircraft, while not dwelling on the loss of the aircraft itself. But President Bush established himself as a master of foreign policy long before the 9/11 attacks, by showing a keen understanding of stakes, appearances, and broader strategy beyond daily events. Dubya's strategic response to the 9/11 attacks, merely continues a practice of applying crisis to accomplish greater goals. As for the tax breaks, no Democrat will ever conciously admit that George W. Bush understand economics, never mind his MBA from the Harvard Business School. That's why John Kerry thinks it's a good idea to remind people, that Bush wanted to create significant tax cuts even before 9/11. What Senator Kerry, "nuanced" or not, seems to miss, is that the motive and effect of the tax cuts was accelerated by the Al Qaeda attacks. President Bush saw the recession coming, and so developed the tax cuts proposal as a two-pronged plan; to force the federal government to rein in spending, by shooting a clear shot across the bow, and to provide tax relief to the small businesses who would need it the most, having been the most maligned by the existing tax code. When 9/11 slammed the economy to the ground, the need for tax cuts, to get money into people's hands as soon as possible, became even more vital. Since John Kerry still doesn't seem to understand these elementary concepts, the disparity between these two main candidates is even more pronounced. President George W. Bush, clearly, should win re-election as President of the United States. now that the first results of the GOP Convention are coming in, it looks as though the nation will choose wisely.